Sweet potato is not only the king of root vegetables, but also one of the most nutritionally rich vegetables available. This wonder veggie can add a healthy boost to our food. Botanically, sweet potato or Ipomoea batatas is a dicotyledonous plant and belongs to the family of Convolvulaceae. It is a starchy sweet tasting tuberous root vegetable whose leaves and stems are also consumed in some areas. It is a distant cousin of potato which is from the family of Solanaceae, but both families belong to the same taxonomic order, the Solanales. The sweet potatoes are not always orange-fleshed on the inside but you may just get one which is of purple colour. 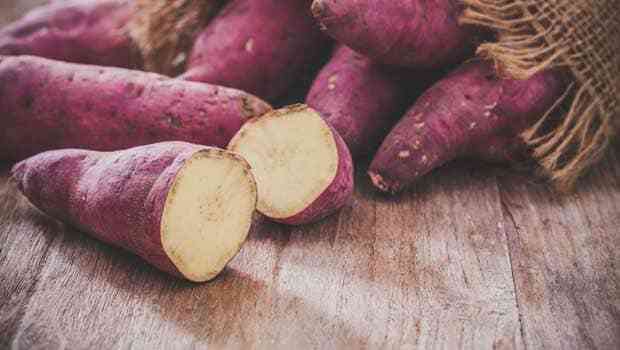 Health Benefits Of Sweet Potatoes: Why You Should Eat It? Carotenoids: Carotenoids give the characteristic orange hue, which is present in huge amounts in sweet potato. B-carotene, a vitamin A precursor present in sweet potato, is associated with immune boosting properties, protects our skin and eyes, and is also beneficial for our heart. The ability of carotenoids in protecting our body from free radical damage is well documented and it is positively linked to preventing degeneration and ageing. Vitamin A is also a critical vitamin for pregnancy. It is essential for the healthy development and maturation of lungs in particular. Beta-carotene protects our skin from the harmful effects of UV rays of the sun. Beta-carotene is known for its ability to prevent macular degeneration in the eyes. Note: To ensure that you assimilate the maximum amounts of these carotenoids, ensure that the meal containing sweet potato also has about 3-5 grams of fat in it to aid their absorption. 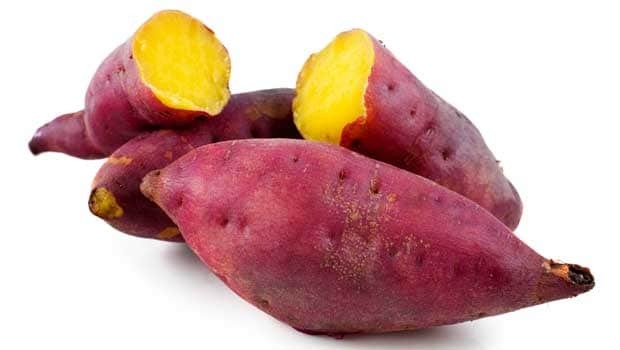 Anti-inflammatory And Anti-oxidant- The anti-inflammatory and anti-oxidant ability of sweet potato is not just limited to its carotenoids, it is a great source of anthocyanin, which is most abundant in the purple-coloured variety. 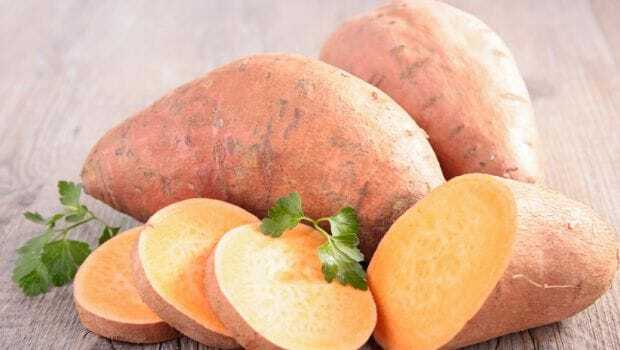 Research has pointed towards the benefits of cyanidins and peonidins present in the flesh of sweet potatoes, towards protection against the potential health risk posed by heavy metals and oxygen radicals. 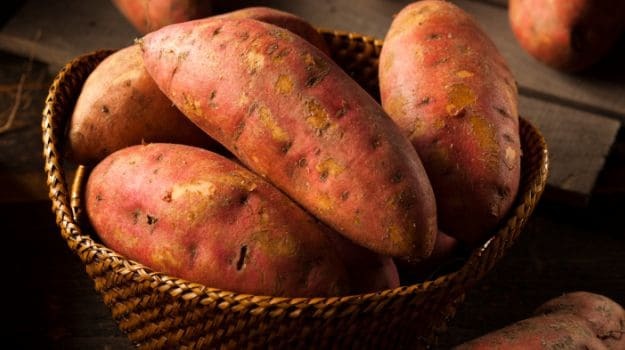 Storage proteins of sweet potato, the sporamins, also contribute towards their antioxidant effect. These proteins have been seen to be released when the tuber is subject to physical injury, helping the veggie heal itself; this property of the proteins is probably what is related to their activity as an antioxidant in our body. 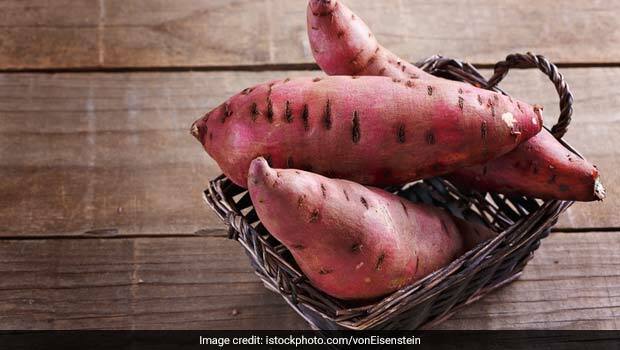 Sweet Potato And Diabetes- The American Diabetes Association calls it a superfood for diabetics because "It is a starchy vegetable full of vitamin A and fibre. It is also a good source of vitamin C and potassium." The myth surrounding diabetes is that anything starchy is bad for regulating blood sugars. Actually, starchy foods can be a part of diabetic meals, provided you control the portion sizes. Sweet potato has a decent amount of fibre and its starchy carbs add to delayed sugar release. In addition, it is a nutrient-rich food, so you are not getting just empty calories. At 109Kcal/100gms and 24gms of carbs, it makes for a decent snack choice or a dessert option. Sweet potato has a GI of low to medium, depending on the cooking method according to the Open Nutrition Journal, 2012, Volume 6, which was a detailed study on the effect of various cooking methods on the GI of sweet potato. Don't have it every day but don't feel guilty either if you snack on some occasionally. Trivia: Did you know that the sweet potato chaatwala you find at the nukkad gets his from the mandi, where they are bulk roasted? While buying sweet potatoes, look for the ones that are firm and do not have any cracks, bruises or soft spots. Store them in a cool, dark and well-ventilated place, where they will keep fresh for upto ten days. Ideally, they should be kept out of the refrigerator. Boiling them seems to be the best method for preserving and increasing the availability of sweet potato's nutrients. So go get some of these healthy, cheap and easily available nutrition bombs.